As many Americans enjoy a day off today in observance of Memorial Day, I'd like to reflect upon what this holiday is all about. As America moves further and further away from the truth of our existence as a nation, the foundation on which we were built crumbles. As our nation morally deteriorates, I am saddened by thoughts of the many lives sacrificed throughout our history to make us the greatest nation on earth. I sometimes feel, as though, our nation has forsaken them. I would like to pay my respects to all of the men and women that gave their lives so that we could have our freedoms and comfortable lifestyles. Their selfless acts of courage and hope for the future of our nation rest upon each of our shoulders. We must never forget the love, pride, and devotion that these brave Americans had for our country as she grew from infancy. May God bless us all with that type of strength and loyalty once again so that we can pull our nation from its slow and steady decline. My father and his two oldest brothers served during WWII. My father was sent to the Pacific Theater to engage the Japanese and his brothers were sent to Europe to engage the Germans. For my Memorial Day post, I would personally like to honor the one that didn't get to come home. PFC Paul C. Cottrill, 23rd Infantry Regiment, 2nd Infantry Division, died shortly after the invasion of Normandy(D-Day) and is buried at the Brittany American Cemetery in St. James, France(top picture) at Plot H Row 3 Grave 1. He was awarded the Purple Heart. Our history is painted from the blood of these great heroes. They are the thread from which our Flag is sewn and the mast from which our Flag is flown. They are true Americans. A timely reminder to the young generation and a wonderful tribute to those men and women who lost their lives fighting for freedom. It's a good thing to honor those who gave some or gave all. They were all prepared to lay down their lives. It's so huge, it makes my heart burst. What is really sad, is that their nations don't honor the veterans properly. They all return with wounds of some kind. They indeed deserve a treatment fit for heroes when coming home. Thank you for this special post. Your relatives are exceptional people - my uncle also served in World War II. But I think more of my father's cousins who survived the war by living in the sewers (their crime was that they were Jews). Because of brave soldiers like those of your family, my father's cousins were able to be set free. We who live in a bastion of freedom so often lose sight of sacrifice. Real sacrifice, where those in battle know why they are there, and the cost that is so close to them. I suppose that those that lived during WWII remember it so vividly. 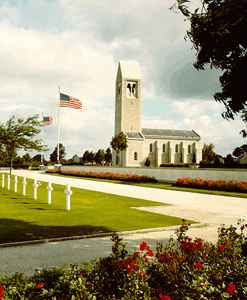 My parents when visiting Europe always visited the Allied cemeteries. They remembered vividly the sacrifices in neighborhoods like theirs - and the country, too. You got it right John. Seems like many don't know why we have this holiday and many just don't care about those who fought for this country. Thanks for sharing your thoughts. Happy Monday! Thank you for remembering what this day is truly about. Very well done. Thank you too John, for your long service for our country. I do hope that all of will always honor that. I liked your final saying, "All Gave Some - Some Gave All." I gave some (five years) but certainly not all. But in a way I did because my whole working life was for people through government jobs. Only thing, except for five, I was not in uniform and would not get shot at. I too visited that cemetary many years ago and was powerfully affected by those seemingly endless rows and the sacrifice made by so very many.